After the CloudFormation stack has been created, test the connection to the Oracle DB instance by using SQL Workbench/J and then create the HR sample schema. Use the OracleJDBCConnectionString value you recorded when you examined the output details of the DMSdemo stack in a previous step. 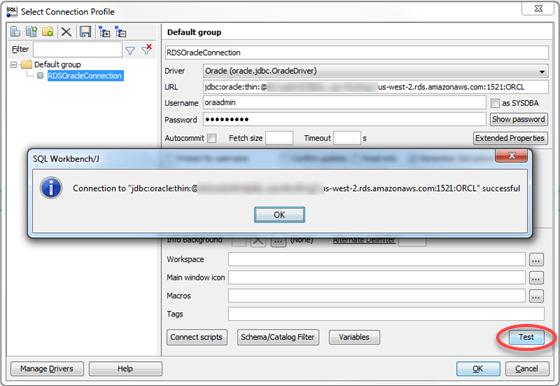 Provide the password for the admin user that you assigned when creating the Oracle DB instance using the AWS CloudFormation template. Extract the SQL script(Oracle-HR-Schema-Build.sql) from the archive. Copy and paste the Oracle-HR-Schema-Build.sql file into your current directory. Open the provided SQL script in a text editor. Copy the entire script. In SQL Workbench/J, paste the SQL script in the Default.wksp window showing Statement 1. Choose SQL, then choose Execute All. When you run the script, you will get an error message indicating that user HR does not exist. You can ignore this error and run the script. The script drops the user before creating it,which generates the error. Verify the object types and count in HR Schema were created successfully by running the following SQL query.